Technically a blue rose cannot exist because roses do not naturally contain blue pigment. Over the years, however, the quest for blue roses has been something of a holy grail for rose breeders and fanciers. Now gardeners can find near blues--marketed with “blue” names--on the market. 'Blue Girl,' also sometimes called 'Cologne Carnival' or 'Kohner Karneval,' is a large flowered hybrid tea rose with moderate fragrance. It originated in Germany and was the Rome Gold Medal winner in 1964. Its color is a kind of silvery pale lilac or bluish pink. It's a commonly available rose in many plant catalogs and nurseries. 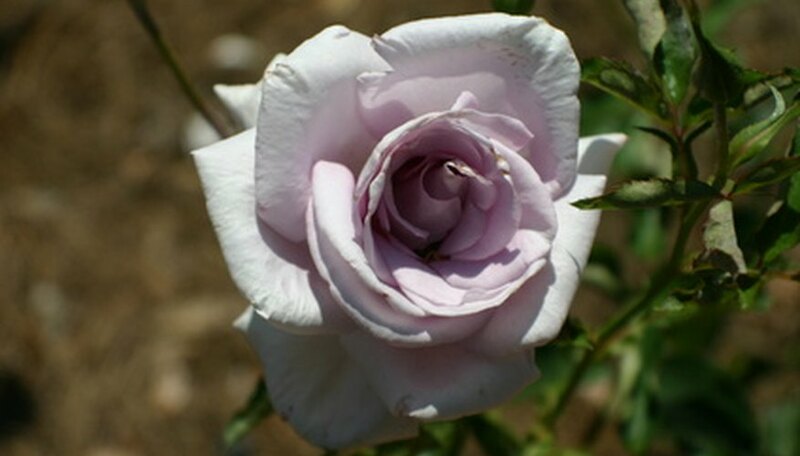 'Blue Nile' is a vigorous grower with deep lavender double flowers with deep violet touches. The flowers may form in singles or in clusters above distinctively large, olive-green leaves. Like all floribundas, or free blooming types, 'Shocking Blue' produces masses of single or clustered blooms of very large size over an extended period. The classic rose-shaped flowers are a deep mauve, which is attractive against its glossy dark green leaves. It is often used in rose breeding to impart color to other seedlings. It is heavily perfumed, with a distinctly citrus fragrance. It grows to 2 feet with a spread of 3 to 4 feet. This variety may be the closest thing to a traditionally hybridized true blue rose available and, in consequence, is quite popular. It is a fragrant tea rose bush (a 'Blue Moon' climbing variety exists as well) best suited for warm sheltered areas of the garden. RoseGardeningMadeEasy.com suggests it be grown against a wall or fence in full sun for protection and is most productive blooming in USDA hardiness zones 5 through 9. For something slightly different, 'Blueberry Hill' is a semi-double rose sporting huge--yet delicate-looking--blooms with a sweet apple scent. It blooms profusely all summer and resembles an azalea bush in form and bloom cover. The bush grows up to 4 feet high. Genetic engineering has given us the first true blue rose. Geneticists from Florigene Ltd., an Australian biotechnology firm (part of the Japanese Suntory group of companies) cracked the code using a color-coding gene from pansies and an enzyme to unlock pigment from irises to create a rose that has nearly 100 percent blue pigment. Diehard rose breeders may consider that cheating, and the panel is still out on whether the blue is really a true blue or mauve. They have been available on the Japanese market since November 2009 under the varietal name ‘Applause,' but they are not available elsewhere, and scientists are still working to develop the color further.